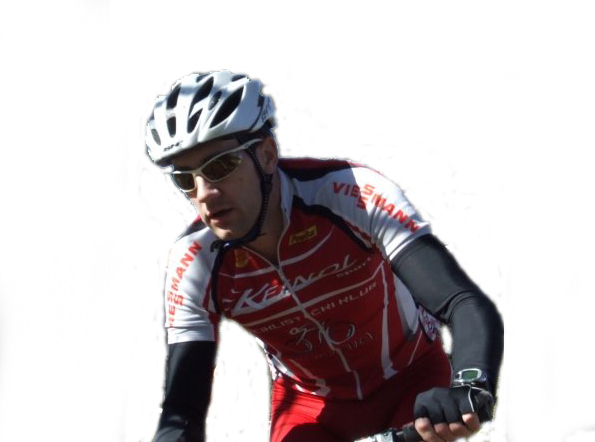 Martin Čotar lives for cycling and is a former professional racer. He was Croatian champion several times, and was once European champion in the category “promises”. On finishing his professional career, he has worked with regional institutes and been involved in developing cycling routes over Istria, to transform it into a cycling paradise. 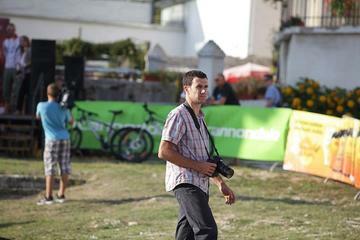 Currently he is the International Cooperation Consultant for the Region Istria, but when such events as the Parenzana race are held he comes running to give the organisers a hand. The Parenzana is a mountain bike race which takes place in late September and is now on its 16th edition and therefore one of the key events in Croatia's cycling season. We meet Martin at the end of the first leg of this race, when the cyclists have by now retired to their rooms. It is a pleasant late September evening, and Martin is trying to relax all be it difficult considering how busy he is kept between cyclists and mobile phone calls. We start off by talking about “Istria Bike”, the detailed website set up by the Region Istria's tourist agency which provides all information online for those wishing to explore Istria on mountain bike. Martin, how has the “Istria bike” initiative developed? Istria Bike is an initiative which has grouped together all the cycle tourism routes, currently 43, around Istria. It presents them all together in a clear and attractive way on one website. The routes have been divided into groups according to their geographical position, and each is described in terms of the terrain, length and difficulty with GPS details, an altimeter, a map and road book. In order to do this we had to do a lot of work to standardise the signposting, organise the routes, assign a code for each area and so on. Once we did this we then organised races to draw attention to the area, the Parenzana race and then another cycling race in the area called “Terra Magica Valamar” which will take place next May. Cycle guides were then promoted, and promotion work was done through photos and video. Now each route is carefully marked by a number and at the beginning of each route there is a map showing the lay out of the route and the places it passes through. We still need to work hard on this Istria Bike project, though, in order to compete with areas such as Bolzano and Majorca. There are another 30 routes which we are aiming to put on this site and this is our next challenge so that we can arrive at over 70 routes online. In SeeNet II, the Veneto Region leads the Action on joint promotion and enhancement of cultural, environmental and historical heritage between Istria and Varaždin, together with Tuscany and Friuli Venezia Giulia, with technical partners Informest and Unioncamere-Veneto. The autonomous Province of Trento is also involved in mountain bike activities through the Action on enhancement of environmental tourism in particular in the areas of Nikšić and Peja/Peć. Was there already a mountain biking tradition in Istria? I wouldn't say so... You first heard of mountain biking in the mid nineties, before that there was only road cycling. Mountain biking is therefore fairly new, although it is quickly growing in popularity. What about the cooperation between sporting associations and institutions? It works well: the public sector provides money for the sporting associations to organise races or sporting events, and this is a direct way of working together. However, it is also an indirect form of cooperation in the way that local cyclists can become protagonists if they take photos or make videos, and therefore they benefit directly in that way. They are able to enter into the productive sector seeing as it is themselves, acting as guides and promoters for their territory and becoming an important part in the promotion of the area and environment. They are also important for keeping an eye on the routes, checking they are in good condition, keeping up the sign posting and acting as guides for promotional events. On these occasions, the cyclists themselves are directly involved and of great value due to their expertise. And what is the relationship with the territory? How does the relationship with the local people change, above all in the rural areas? This is also changing, and people are gradually getting used to it. Cyclists look for routes which go through lesser known places and are off the beaten track, they look for small yet beautiful things and here in Istria you can find a lot. Slowly but surely smaller and more isolated places are joining the tourist trail. Villagers are starting to speak other languages, and have more contact with tourists. The cycle tourist has a sophisticated taste, and looks for good value for money preferring a well kept 3 star hotel to a plush four star one, and favouring local food: simple but genuine. The cycle tourist is also well informed and knows a lot about the territory before arriving. They use GPS and do thorough research before the trip. As well as that they drink and eat heartily seeing as they need to recuperate energy. All in all they are less intrusive than other types of tourists, for example motor bikers who often venture off road and provoke complaints, especially from farmers. We can therefore define a cycle tourist as the typical responsible tourist. For the future we firstly need to secure funding to continue the Parenzana 3 project which, as in the previous editions, will be funded by IPA, UE funds. This way, the already existing infrastructures, which are already well developed, can actually become self sustainable. From this point of view it would be a good idea to entrust part of the routes to private sectors and profit making companies, so they can be well maintained and developed in order to offer tourist packages. Another possibility is that of promoting the area by taking visitors into local producers' cellars, and in this way enriching what the area has to offer. What is missing at the moment is a central organisation which can bring the local producers together, coordinate everything and set up various projects which need to be decided on together. This is the direction we need to take, one which includes everyone and yet considers individual requirements in order to set up a general plan, and we realise that we need to fill this gap. We really need a central organisation, a type of institution which is based on trusting partners who must in turn follow suggestions put forward, a type of agency for tourism development. This is the type of organisation which could prolong the tourist season, including May and June and September and October. Therefore we need to focus on the approach to take, give priority to certain events and make progress without wasting funds and managing to keep everything linked together. Next year we will dedicate our time to programming and doing appropriate marketing, and we need to prepare various projects in time so as not to lose out on opportune occasions. We need to move swiftly keeping in mind that time flies.